As a farmer or a rancher, your horses are more than just animals; they are tools to help you finish your job more efficiently. And just like any other tool, you need to keep them safe, and the best way to do that is with steel horse barns from Coast to Coast. 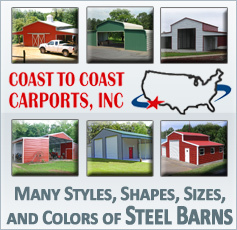 We sell steel buildings all over the country, and that means we know what you need from your steel horse barns. Weather conditions in the west can be extremely hard to deal with, and you need a barn that can handle them all. Do not waste your time with inferior barns made from wood; only a steel barn from Coast to Coast can ensure that your horses stay safe during the long winters and harsh summers that you can experience. When you buy steel horse barns from Coast to Coast, you know that you are going to get a high quality product that will last you a long time. 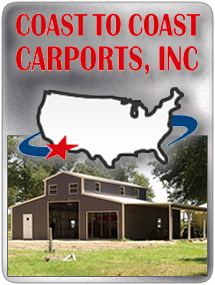 Everything that we sell at Coast to Coast comes with a 20 year warranty on rust through of framing on roofing material assuming normal user care and maintenance and is made with the highest quality 12, 14 and higher gauge steel. A guarantee like that will give you an incredible amount of peace of mind, since you know that Coast to Coast really stands behind our products. Your jobs require that you use the best equipment out there, and to keep your equipment lasting a long time, it needs to be stored somewhere where it will be safe. Your horses are no different. When you want the best in storage, you need look no further than Coast to Coast for any of your storage needs. From horses to tools and crops to tractors, nobody builds better buildings than we do.